Never trust a cook who doesn’t like to eat and never trust a writer who doesn’t like to read. As THE ROMANCE DISH is primarily a romance book review site, many of you may recall the blog, SQUAWK RADIO, helmed by no less than romance writing giants Connie Brockway, Christina Dodd, Teresa Medeiros, Eloisa James, Lisa Kleypas, and Elizabeth Bevarly. So when Connie Brockway, at the behest of Christina Dodd, suggested ten years ago we readers go out and get THE HISTORIAN, I did as I was told. She’s a writer who reads. And because I love both Brockway and Dodd’s writing, I knew I was in for a treat. A Halloween treat, no less. 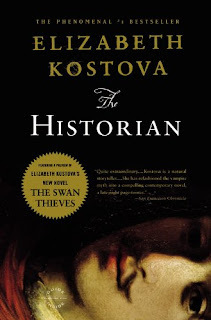 THE HISTORIAN begins with an adolescent girl exploring her scholarly father’s library where she finds letters addressed to: “My dear and unfortunate successor.” So opens a door into the dark world of Vlad the Impaler, Dracula himself, and, strangely, into the hidden past of the girl's father, which seems inextricably linked to the medieval ruler. If Connie is jealous of Kostova’s style, what are the rest of us to feel? I tell you what. We’re to feel the pleasure of Kostova’s writing. We’re to thirst for it with the zeal of a vampire sensing blood. We took the train to Paris and later a car south into the Cévennes. In the mornings I worked on two or three essays in my increasingly lucid French, to mail back to school. I still have one of these; even now, decades later, unfolding it returns to me that feeling of the untranslatable heart of France in May, the smell of grass that was not grass but l’herbe, edibly fresh, as if all French vegetation were fantastically culinary, the ingredients of a salad or something to stir into cheese. I am in France because I can taste and smell it all through the magic of Kostova’s word combinations. The book is loaded with such passages—those that make a reader stop, reread, and highlight—so much so I found myself savoring the hours spent pouring over it. Never before had I known the sudden quiver of understanding that travels from word to brain to heart, the way a new language can move, coil, swim into life under the eyes, the almost savage leap of comprehension, the instantaneous, joyful release of meaning, the way the words shed their printed bodies in a flash of heat and light. Since then I have known this moment of truth with other companions: German, Russian Latin, Greek, and—for a brief hour—Sanskrit. If any of you have learned another language, you know the beautiful truth of every single syllable in the above paragraph. I’m gushing, I know. The writing is that good. But I admit it is not the perfect book. I have some issues near the end, as well as impatience with details that could have been pared back. Still. THE HISTORIAN is worth the 650-page effort. Never trust a writer who doesn’t read. Never trust Dracula. Happy Halloween. And don’t forget your garlic necklace. What are some of your favorite creepy reads? THE HISTORIAN is now mine. Wow! This does sound like a book that would really grab me. I loved how the author described the learning and understanding of a new language. With several years of Latin under my belt, our move to Paris left me feeling like a true dummy. However, as I started learning the language, mostly by rote, but also via classes, it became natural and the words flowed. That was when I began to work at saying the words without an American accent. Don't get me wrong. I'm nowhere near fluent but it's very intriguing to learn a new language. I shall look for this novel and take some time to devote to reading it. I find I read more and more history books these days because it's written so beautifully and not presented as dry facts the way we were taught it in school. The line: ".... the almost savage leap of comprehension, the instantaneous, joyful release of meaning..." really captures the experience, doesn't it? It's a fabulous book, Connie. I envy you all the unread pages before you. I'm going to have to devote myself to getting ahead with my review books so I have time to devote to The Historian. I have the feeling that once I start I won't want to put it down. I too love that line about learning a new language. When I was sixteen I spent the summer studying in France. After two years of high school French, I was skilled at translating the words I needed from English to French but I can still remember the "instantaneous, joyful release of meaning" that occurred the first time I started thinking in French. It was incredible! I'll lend you my copy, PJ. Don't mind all the underlining. Usually when I want creepy I read Stephen King! I've not read The Historian - another book for my tbb pile lol. Thanks. I read one Stephen King book. That was enough for me! Stephen King is beyond creepy. HISTORIAN is more diet creepy. Great writing though. Which of King's is your favorite? Peter Straub and Stephen King were my go to creepy scary books. Love Christina & Connie. Will have to read The Historian. I'm too chicken to try a Straub. You're brave! The Historian is more creepy thrill than terror. But the writing is to die for. You have to come back here and tell me what you think! I don't like creepy books. I don't mind reading about good vampires though. Then this is half-suited for you. Or maybe more but if I explain it would be spoilerish. Souds like a book to savor, but I would have to wait until I have a big chunk of time to devote to it. I tend not read creepy books. I scare easily. There was however a short story I read in college (mid-1960's) that is still vivid in my mind today. It was called THE BAMBOO TRAP and I don't know the author. I would like to find it again to see if it would still give me nightmares. I'm going to look it up. And I scare easily as well. Honestly, it was the quality of this one that kept me in my reading chair. But you do need a big chunk of time.